The Town of Windsor Colorado has ridden the Earth around the Sun 90 times since the Windsor Harvest Festival was first held. They are about to complete the 91st trip beginning this this Labor Day Weekend. It all starts Saturday at 7:00 AM with hot air balloon launches which is followed by many fun activities including a street dance and a great fireworks display that evening. The whole town comes alive and on Sunday and Monday there will food galore with a wide variety of choices offer by various restaurateurs. Combine this with hundreds of other vendors of all kinds, live music, a beer garden (a gotta have offering in a town full of the descendants of Germans from Russia), and a chili cook off. 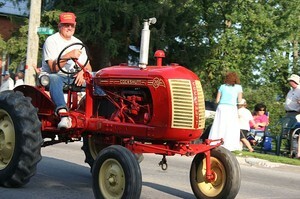 Monday begins with the traditional Windsor Harvest Parade – filled with antique cars, antique sooped up tractors (these probably could no longer pull a plow, but might be able to break the town speed limit). And guess what --- this whole thing is free! While you are in Windsor you should head out south of town on 7th St and visit Water Valley, an amazing resort community with lakes, a 27 hole golf course, A Good Samaritan Retirement Village and a state of the art Wellness Center associated with the world class University of Colorado Health System – formerly the Poudre Valley Health System. There is an abundance of homes and lots for sale in Water Valley and it is a wonderful safe place to raise a family or retire. You have to see it to believe it. You want to build a home there, settle in, and enjoy the Windsor Harvest Festival again in years to come. If you would like more information at Windsor, or more specifically Water Valley, please phone me at 970-412-1657 or contact us below. We can also help you with extensive information about market trend, mortgages or general information about homes and condos for sale in Fort Collins and other nearby cities such as Timnath, Loveland, Berthoud, Severance, Wellington, and nearby urban or rural Northern Colorado areas. Also, check out more information on the town of Windsor here.